Add the Deco Fly Mask to your special occasion masquerade outfit & dress it up to be feminine or masculine – the mask looks good on men or women.This genuine Venetian carnival inspired masquerade mask is elaborately created in a striking light blue with gold & white, uplifted by a flattering shade of darker blue. Ready to flatter with your chosen masked ball costume, the paint has been applied to give a stunning beak like effect – a design feature which makes this mask extra special. Comfort isn’t sacrificed for quality in the design. Handmade means fitting beautifully on the face with satin ribbons and staying place the whole night long. 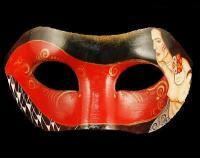 In this beautiful party mask, you'll be certain to stand out.